Ballinacourty made much of the odds that were given on them to beat Kilcummin in the semi-final, supposedly making a killing at the bookmakers, which is nice. But one wonders whether they’ll be all so eager to dip their hands into their pockets when they take on the might of Nemo Rangers today. Punters are always crowing after sticking it to the bookies, but you rarely hear of the failures – perhaps they’re drowned out by the sounds of the bookmaker’s Jag. A Waterford man will lift the cup today either way, with Jimmy O’Gorman presenting to either John “Effin'” Hurney of Ballinacourty or Niall Geary of Nemo. ‘Gears’ grew up near to where I now live, so you’ll have to forgive me when I say that I hope he crashes and burns today. Come on ‘Courty! Update: better big up the Tramore man as Nemo win by 1-10 to 1-7. Having been nine points down at half-time, it was a brave effort, although the demeanour of Pat Moore after the game on WLR spoke of a man not content with brave efforts. 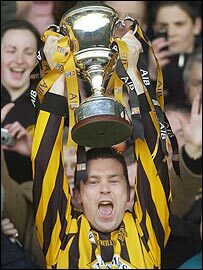 Hard luck, Ballinacourty, and here’s to Niall Geary lifting the Andy Merrigan Cup in Croke Park on St Patrick’s Day 2008. This entry was posted in Football, Munster, Waterford and tagged Ballinacourty, Munster, Nemo Rangers on 09/12/2007 by deiseach. Ballinacourty are the last chance of a Waterford senior team going unbeaten in 2007. One of the strangest facets of Waterford GAA is the inability of the senior football champions to make a mark on the Munster scene. The Nire and Stradbally have both gone close in recent years, but five finalists in over thirty years seems like a poor return from such a robustly competitive championship. Perhaps the need for a competitive hurling championship is a red herring in the quest for senior hurling success. Anyway, good luck to Ballinacourty today against Kilcummin. Update: and whaddya know? Ballinacourty win by 2-6 to 0-8. They’ll meet some team of nobodies called Nemo Rangers in the final. Well done to Ballinacourty. This entry was posted in Football, Munster, Waterford and tagged Ballinacourty, Munster on 25/11/2007 by deiseach. Beware the ides of November! When living in Galway, I knew a fella from Abbeyknockmoy. He was the lone Galwayman of my acquaintance who viewed their then-success in football as a mediocre substitute for hurling success. Upon inquiring as to the quality of his club, I was proudly informed that they had won the County Cup (a figure of speech to which the county title is universally referred in Galway) in 1988. And how had they done in the All-Ireland series? Face darkens. It seems the team had spent the week after winning the county on the pop, and were duly ambushed by the Roscommon champions (NB this link show them losing in 1990. Shome mishtake, shurely?). This was the last occasion on which the Galway representatives did not get to the All-Ireland semi-finals. If either Ballyduff Upper or Ballinacourty (or both of them) lose in their respective Munster championship ties, no one could say it was an ‘ambush’. But the danger of players still celebrating a fortnight after their long-yearned-for successes is very real. First up is Ballyduff Upper, playing the Clare champions Tulla in Ennis. Lads, hit the ball first, hit the bottle later. Update: ye can hit the bottle now, lads. Tulla won 2-13 to 0-14. Hard luck to Ballyduff Upper. This entry was posted in Hurling, Munster, Waterford and tagged Ballinacourty, Ballyduff Upper, County Championship, Munster on 18/11/2007 by deiseach. Ballinacourty won their fourth county football title with a three point win over Ardmore in Dungarvan. It didn’t sound like a great match (report here) and it’ll probably only stick in the memory because of an, um, overexcitable victory speech from captain John Hurney, from whence a certain four letter word originated. I was hoping Ardmore would win, for the sake of the multiple hurlers on their panel, which only goes to confirm my prejudice in favour of the small ball game. Still, well done Ballinacourty, and all the best in the semi-final of the Munster club championship against Kerry’s representatives, Kilcummin. This entry was posted in Football, Waterford and tagged Ardmore, Ballinacourty, County Championship on 13/11/2007 by deiseach. We’ve had two clubs dominating the hurling championship for the last decade, and it’s great to see that overturned by a club who haven’t won it in two decades – isn’t overturning the natural order what makes Waterford’s quest for the McCarthy Cup so compelling? With that in mind, this year’s county football championship is even more noteworthy. After seven years of hegemony from Stradbally and The Nire, we have two clubs in the final who have waited a long time for senior success. Ballinacourty haven’t won the county title since 1981 and Ardmore – remarkably, a dual club – are looking to win it for the first time since 1977. Someone is going to have that Ballyduff feeling in Fraher Field on Sunday. This entry was posted in Football, Waterford and tagged Ardmore, Ballinacourty, County Championship on 07/11/2007 by deiseach.